There's nothing like starting the New Year with a fresh set of stationary, so what better present to give someone than some bits to help them get organised for the year ahead. As I've said before in my Tiger Stationary Haul I am a huge fan of stationary. So when I sat down to plan my Blogmas posts I decided I would do a stationary gift guide. I searched the Internet for my favourite bits and I've chose just six products that I loved enough to put into this guide. 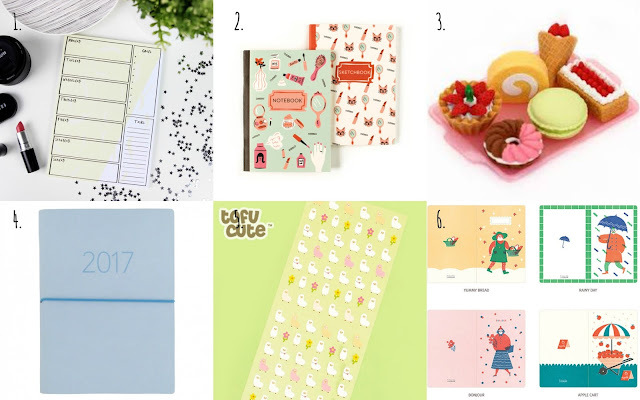 I've done my best to gather an array of products ranging from weekly planners, to stickers, to yearly diaries so hopefully you'll find something you like. So whether you're looking for a small gift for someone or if you're looking to start the year with some new stationary bits you're sure to find something you like from any of the above companies. And a HUGE shoutout to Chloe (www.mojichlo.co.uk) who runs thatlamecompany. She designs all the products over there so do make sure to have a look!